Please note that there is no charge for your first visit to Kelly Orthodontics. Our new patient examination appointment will introduce you to our doctors, team, and office. In addition to an office tour, you will be meeting one on one with one of our doctors. A thorough, comprehensive clinical examination will be performed to determine the need for orthodontic treatment. If Dr. Kelly feels treatment is necessary he will explain appropriate recommendations and answer any questions you may have. 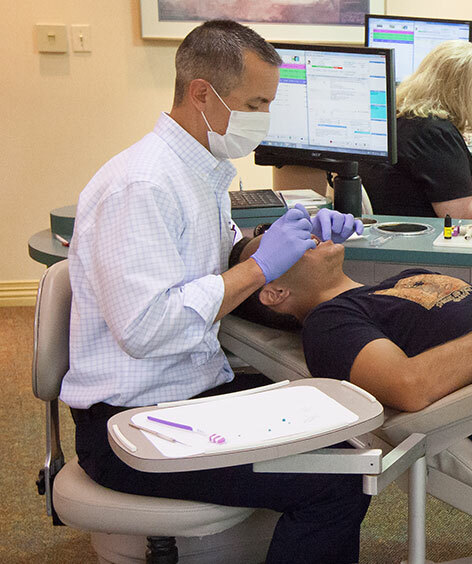 One of the things that make Kelly Orthodontics unique is that the doctors perform this initial examination themselves. We feel that this personalized approach makes our office very approachable and responsive to your questions. Timing is an important factor in planning orthodontic treatment. That is why treatment may not be indicated when we first meet a patient. There may be a benefit in waiting for further growth or tooth development. If this is the case then the doctors will recommend following your family on a six month growth observation program. These six month evaluations are free of charge and allow for optimal communication as well as proper timing for potential orthodontic treatment. If orthodontic treatment is indicated at the initial new patient exam, then the doctor may recommend gathering additional diagnostic records (at no charge to your family). These consist of digital orthodontic x-rays, digital photographs, and models. The doctors will carefully analyze this information and create a customized individual treatment plan for your family. Part of our personalized approach is to present our detailed treatment recommendations, timeframes, and financial options available at a separate consultation appointment. Our philosophy is that communication is the most important part of orthodontic treatment. This personalized approach allows us to gain the trust and confidence of our patients before they consider starting any orthodontic treatment.